Virginia Gov. 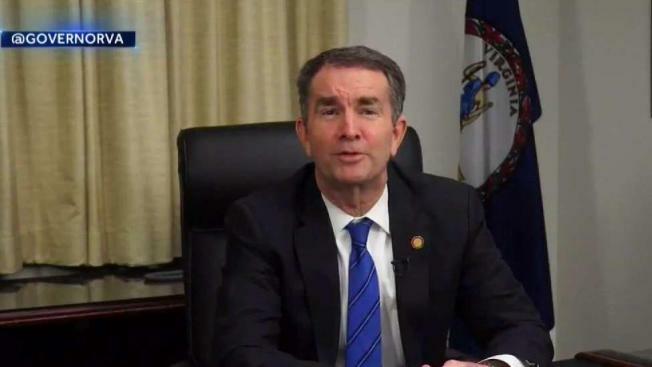 Ralph Northam's office put much of the business of governing on hold Tuesday as the Democrat privately weighed whether he can stay in the job despite the uproar over a racist photo on his 1984 medical school yearbook page. Negotiations between the governor's office and the Republicans who run the legislature were suspended on what was otherwise one of the busiest days on the legislative calendar. Northam wasn't making any of the public appearances he does almost every weekday. The regular economic development announcement emails have stopped. Instead, the 59-year-old Northam conferred with top advisers about whether he can continue to effectively govern despite turmoil over the photo, which depicts someone in blackface standing next to another person in a Ku Klux Klan hood and robe. The photo, which surfaced Friday, set off a barrage of calls for his resignation from his own party. And with uncertainty hanging over state government, former allies were growing impatient. State Sen. Louise Lucas, a prominent African-American lawmaker who has pressed for Northam to step down, said the governor doesn't need to take a few more days to make up his mind. "I am so praying that he will do that and get it behind us," Lucas said. "What's a little bit more of time going to do for us?" Northam gave no public indication of which way he was leaning, but his first official words since the weekend offered a sign of the difficulty he faces in carrying out his duties. He issued a statement Tuesday offering condolences on the killing of a state trooper in a shootout, prompting a flurry of Twitter comments urging him to resign. In a rare positive sign, state Sen. Richard Stuart issued a statement of support, becoming the first Republican lawmaker to do so. And protests around the governor's mansion died down, with only one anti-Northam demonstrator present at midday. "Poor judgment 34 years ago should not outweigh a selfless service to people from every walk of life," Stuart said. The uncertainty comes at a time when Northam's office is in the middle of negotiations with the legislature over a major tax overhaul and changes to the state budget. Tuesday was "crossover day," when the House and Senate must finish bills to send to the other chamber. The crisis deepened when the man next in line to be governor, Democratic Lt. Gov. Justin Fairfax, was confronted with an uncorroborated allegation of sexual misconduct first reported by a conservative website. Fairfax denied the allegation Monday and called it a political smear, saying the 2004 encounter with a woman was consensual. The woman has retained Washington law firm Katz Marshall & Banks and is consulting with it about her next steps, said a person close to the legal team who was not authorized to discuss the matter and spoke on condition of anonymity. One of the firm's founding partners, Debra Katz, represented Christine Blasey Ford, who accused Supreme Court nominee Brett Kavanaugh of sexually assaulting her decades ago when they were teenagers. Kavanaugh denied the allegation and was confirmed to the court. The Associated Press is not reporting the details of the Fairfax accusation because AP has not been able to corroborate it. Northam, a pediatric neurologist who graduated from Eastern Virginia Medical School and came to politics late in life, is one year into his four-year term. If Northam resigns, Fairfax will become the second black governor in Virginia history. The furor over the photo erupted Friday, when Northam first admitted he was in the picture without saying which costume he was wearing. But a day later, he denied he was in the photo, while also acknowledging he once used shoe polish to blacken his face and look like Michael Jackson at a dance contest in Texas decades ago. As for the allegations against the lieutenant governor, The Washington Post said Monday that it was approached by the woman in 2017 and carefully investigated but never published a story for lack of any independent evidence. The woman did not immediately respond to a voicemail, text message or email from an AP reporter.